Demoso (Burmese: ဒီမောဆိုးမြို့) is a town in the Kayah State of eastern part of Burma. Mese (Burmese: မယ်စဲ့မြို့) is a town in the Kayah State of eastern part of Burma. Bawlakhe Township (Burmese: ဘော်လခဲမြို့နယ်) is a township of Bawlakhe District in the eastern part of Kayah State in Myanmar.The principal town lies at Bawlakhe. 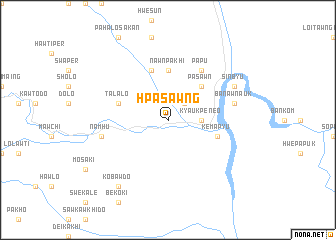 Hpasaung Township (Burmese: ဖားဆောင်းမြို့နယ်) is a township of Bawlakhe District in the Kayah State of Myanmar.The principal town lies at Hpasaung. Shadaw Township (Burmese: ရှားတော‌မြို့နယ်) is a township of Loikaw District in the eastern part of Kayah State in Myanmar.The principal town lies at Shadaaw. Shadaw (Burmese: ရှားတောမြို့) is a town in the Kayah State of eastern part of Burma. Loikaw District (Burmese: လွိုင်ကော်‌ခရိုင်) is a district of the Kayah State in eastern part of Myanmar. Hpruso Township (Burmese: ဖရူဆိုမြို့နယ်) is a township of Loikaw District in the eastern part of Kayah State in Myanmar.The principal town lies at Hpruso. Bawlakhe (Burmese: ဘော်လခဲမြို့) is a town in the Kayah State of eastern part of Burma. Hpruso (Burmese: ဖရူဆိုမြို့) is a town in the Kayah State of eastern part of Burma. Bawlakhe District (Burmese: ဘော်လခဲခရိုင်) is a district of the Kayah State in eastern part of Myanmar. Loikaw Township (Burmese: လွိုင်ကော်‌မြို့နယ်) is a township of Loikaw District in the eastern part of Kayah State in Myanmar.The principal town lies at Loikaw. Kong Pyek is a small town in Loikaw Township, Loikaw District, in the northern part of Kayah State of eastern Burma. It is located south of Tongkaw in Shan State along National Highway 5. Hpasawng (Burmese: ဖားဆောင်းမြို့) is a town in the Kayah State of eastern part of Burma. Demoso Township (Burmese: ဒီမောဆိုး‌မြို့နယ်) is a township of Loikaw District in the eastern part of Kayah State in Myanmar.The principal town lies at Demoso. Mese Township (Burmese: မယ်စဲ့‌မြို့နယ်) is a township of Bawlakhe District in the Kayah State of Myanmar. The principal town lies at Mese.